As one of India’s leading store for Superheroes and comic character merchandise that has actively worked towards building a community of superhero fans in the country, this contest is a tool to engage with fans. 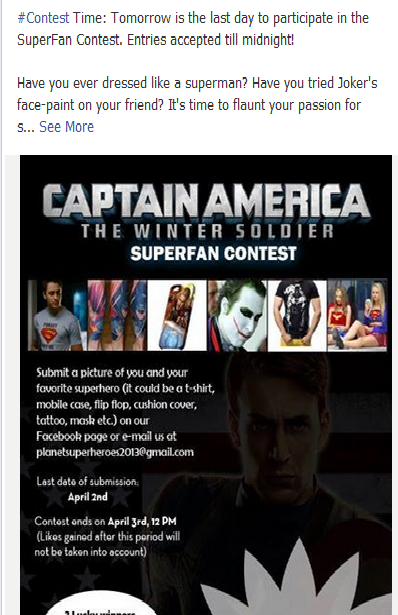 The idea behind this digital contest is to ride on the buzz around the release of the Captain America Winter Soldier. The SuperFan contest, thus, serves to keep fans engaged and interested while putting the spotlight on the release of yet another superhero movie. All that the participants need to do is to send a picture of themselves with their favorite superhero products (T-shirt, mobile case, tattoo etc.). Planet Superheroes urged participants to dress up in their favorite superhero tees or to try out Joker’s face-paint on themselves and take a picture for the contest. 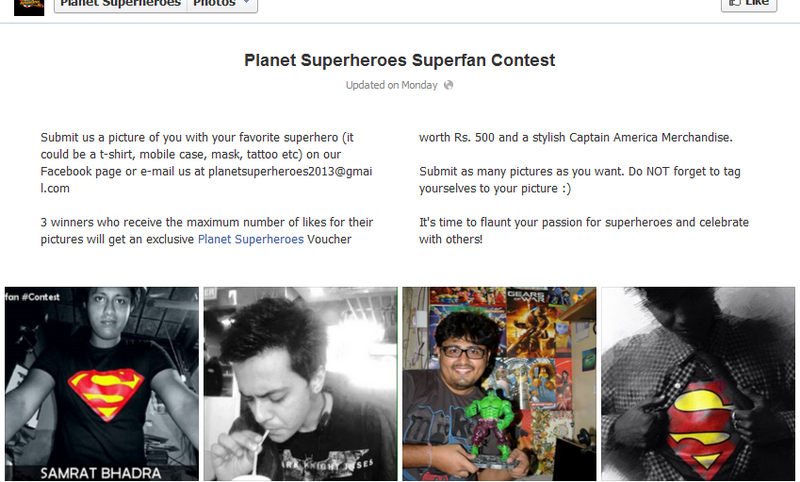 Entries could be submitted on the Planet Superheroes Facebook page. One could submit as many pictures as one wants to. Prizes: 3 winners who receive the maximum number of likes for their pictures will get an exclusive Planet Superheroes Voucher worth Rs. 500 and a stylish Captain America Merchandise. The contest is simple as it involves taking a picture and simply sharing it on the Planet Superheroes Facebook page or emailing it. One can share and tag oneself in the pictures and the maximum likes can help you win prizes. Thus, the viral aspect is also taken care of. The prizes on offer are those that will attract superhero fans and successfully put the spotlight on Captain America. Taking a picture and sharing it online while working towards getting maximum likes for it ensures that there is online and offline integration for the contest. Fans have been actively engaged with posts and updates on Twitter and Facebook to keep the contest in their memory. Despite all efforts to attract fans, the contest album comprised of just 61 entries. With a fan base of 36,915 on Facebook alone, the response to the contest leaves much to be desired. The contest lacks an innovative approach and creative twist. As the contest is photo based, Instagram and Pinterest should have been used to draw a better response. 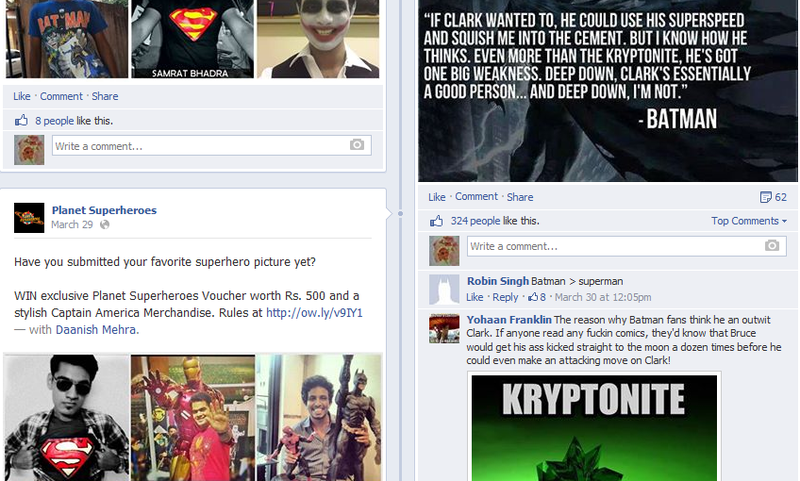 Despite engaging with fans on Facebook and Twitter, the response to the contest has been lukewarm at best. The Planet Superheroes SuperFan contest has been timed to build buzz as the next instalment of Captain America releases. However, overall the contest has not aroused the interest of fans like it should have. Facebook Introduces a Single Chat Interface for Messaging. Removes Chat from its Main App.